Bar L Equine Conditioning Center, LLC is commited to improving your horse physically and mentally. Whether you show your horse in performance events, halter classes, or just want your horse to look and feel his/her best, our water treadmill and vibration plate can help your horse attain maximum fitness to do his job. The Equine Aqua Pacer Treadmill (above header photo) allows each horse to receive a custom session based on their individual needs. By controlling the amount of water that enters the unit, varying the speed of the belt and visualizing the horses legs throughout each session, we can carefully monitor your horse’s progress. Water treadmill conditioning can enhance overall circulation, improve cardio/respiratory function, strengthen muscles throughout the body and improve gait. The water provides sufficient buoyancy to relieve joint wear and tear while maintaining a mild degree of impact necessary to maintain bone density. We can also provide rehabilatation for horses post injury and/or surgery with veterinarian referral. Helps improve mental attitude—horses enjoy the Aqua Pacer experience!! The Equi-Vibe total body vibration platform is our newest addition. Total body vibration for the horse is the result of technology developed for the space industry to help astronauts avoid bone & muscle loss in space weightlessness. Used in human conditioning for over 20 years, it is now being used for horses to increase bone density and increase hoof and hair growth. Most horses find the vibration platform very relaxing and willingly adapt to this device. 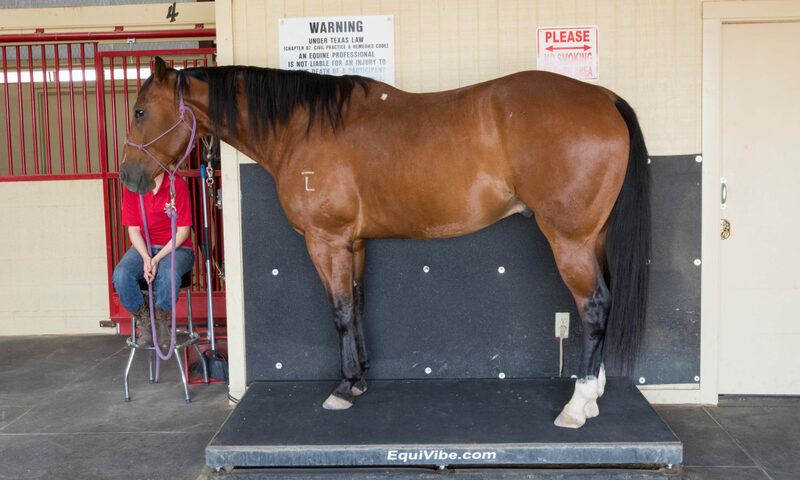 Since the horse is only required to stand on the platform, the Equi-Vibe plate can be usefull to help rehabilitate horses soon after illness or injury. One key ingredient to excellent equine health is nutrition. We feed our horses our in house mix of “On the Money”™ horse feeds. If you love your horses, and at the same time keep feed expenses down with top quality nutrition, then ask us about our “On the Money”™ horse feed. This feed is fed to some of the top performing horses on the circuit today. Ask us how this feed could fit into your horses nutrition program on your next visit with us. Click here for nutritional information and a copy of our brochure. Call for an appointment at (806) 863-2202. All work is done on an appointment only basis. Call (806) 863-2202 to schedule your appointment. If no answer leave a voice message & we will get back to you. Bar L Equine Conditioning is about your horses performance. We have the skills and tools to help your horse reach its peak in health and performance.